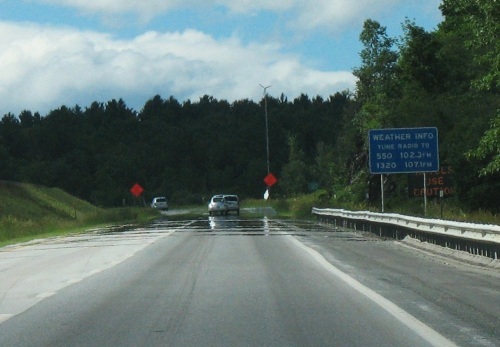 We often see what appears like water on a dry road on sunny, hot days. However, when we get to the water-like area that produces the reflection, the road is perfectly dry. This is an optical effect called a mirage. It appears not only on roads and pavement, but also on deserts or any open area subject to heating by sunlight. These mirages are caused not by any water on the surface, but by warm air immediately above the pavement. The sunlight beating on the pavement warms the pavement significantly above the ambient air temperature. The warm pavement in turn warms a layer of air immediately above the pavement. The warm air layer is about 5 cm deep. The simplest model to explain the mirage considers the warm air to have a definite thickness and a well-defined boundary with the cooler ambient air above it. Because warm air is less dense than cool air, it has a lower refractive index. Consider light originating in the cold air above the boundary. When the light strikes the boundary to traverse into the region of less refractive index it bends. If light strikes the boundary at a shallow grazing angle, it is totally reflected by the boundary. This is called "Total Internal Reflection". The cold air resembles the material inside of glass - it is denser than the warm air. For glass, total internal reflection occurs whenever the angle between the internal ray and the glass surface is less than about 48 degrees. The critical internal angle for total internal reflection for glass is rather large due to the large relative refractive index for glass. For the hot air mirage, however, the critical angle very small because the hot air and cool air have very close refractive indices. The sharp boundary for a hot air mirage and total internal reflection is an over simplification. Instead of a sharp boundary, there is a temperature gradient over the hot pavement and a corresponding smooth variation in the refractive index. As a result the light reflected in a mirage follows a curved path rather than a straight path. The curved path model and the straight path from a sudden change produce the same overall results.